Update June 2014: See a video on this work at: http://www.youtube.com/watch?v=IVS_wlskqjs&feature=youtu.be. Uganda is Africa’s second largest producer of coffee and has the largest agricultural sector in the East African region. However, soils in parts of the country are nutrient poor which can lead to poor harvests and potential food shortages. This poor soil translates into subsistence farmers having less income and looking towards other means for income generation. To help create alternative sources of income for the population and spur new industry, the Uganda Industrial Research Institute (UIRI), which is the Ugandan Government’s lead agency for industrialization and the country’s main vehicle for implementing strategies and measures aimed at transforming industry in Uganda, created a bamboo program to train people in the production of consumer goods such as furniture, blinds, woven baskets, and other handicrafts. With the unused material left from these production activities, UIRI is training individuals to produce matchsticks, toothpicks, as well as a biochar feedstock. Bamboo is widely used in rural communities in western Uganda and is easily available throughout the area. This idea was conceived when Mr. Julius Turyamwijuka, a product manager at the UIRI, met Mr. Robert Flanagan in 2010 at the China Bamboo Research Center (CBRC) where both had gone to conduct research in China. It was at this meeting that the two exchanged ideas on biochar production and the UIRI program was developed. 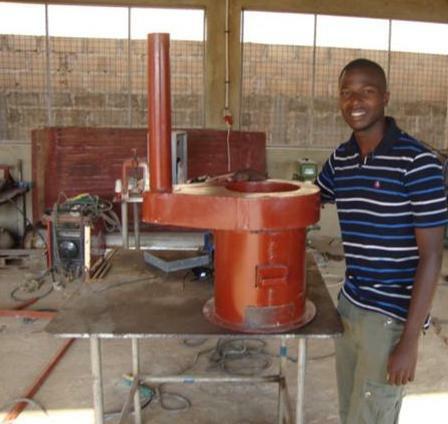 Since June 2009, Turyamwijuka has been working on a bamboo/biochar research project with Flanagan—by developing a stove prototype that can utilize the unused bamboo by-product to produce biochar. This stove can also utilize sticks from agricultural waste which the rural population uses where bamboo is less common. Since UIRI is a government institute, the budget for industrialization activities within UIRI is government funded. 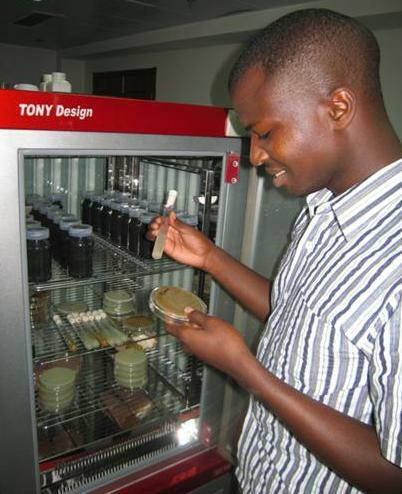 Turyamwijuka recently received notice that his $2.8 million dollar proposal to the Ugandan government to further his bamboo/biochar research project, including the capability for stove production and dissemination, as well as field trials, was approved. The bamboo/biochar project’s primary focus is to introduce biochar and pyrolysis technologies at the household level with selected villages and districts. This will first be initiated with proof of concepts (POCs) at UIRI and various field sites and will involve setting up full monitoring experiments in the villages to analyze the biochar characteristics and corresponding plant growth. The biochar stove prototype uses only a few sticks as its feedstock rather than the traditional charcoal that is used by many Ugandans as a primary fuel source. With the high cost of fuel wood in the countryside, combined with smoky 3 stone fires, a cleaner and more economical cooking source is desired by many who use biomass for cooking. The focus of the UIRI program is to start working in 50 of the 200 districts in Uganda within three years. Of these 50 districts, the team has selected four villages in which to conduct the first field tests and trials. One of the additional aspects the project is looking into is how to provide electricity generation. A prototype biochar stove was developed that has an energy charging aspect—some stove models will be built with a thermo-electric generator that can convert heat energy to electric energy. An adapter can be connected to the stove capable of charging a cell phone. 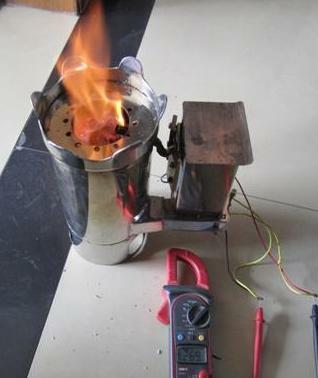 The project already has a stove prototype built and tested at the UIRI. It is anticipated that as the funding starts comes in, the project will move into the four villages for the training, testing, and field trials stage. For more information on this project, please contact Julius Turyamwijuka. Alternative energy saving stove without a charging system; all photos courtesy of Julius Turyamwijuka. Initial results have been promising. 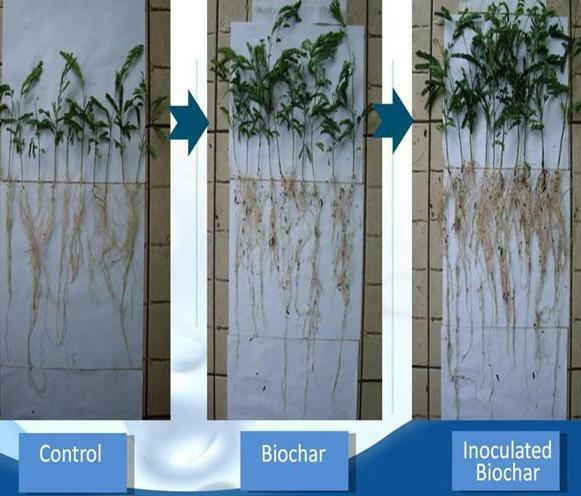 Research on biochar fertilizer in the lab. The stove has a Thermo electric generator in build which converts heat energy to electric energy. Thus an adapter can be connected to the outside environment through the primary holes.